While demonstrators outside the Kay Bailey Hutchison Convention Center insisted the #MeToo movement to stop sexual abuse demands a comparable #ChurchToo movement, messengers inside facility’s meeting hall attempted to respond to their concerns while holding onto a traditional understanding about the role of women in church life. The convention’s resolution accepted an amendment from a messenger adding an apology to those who have suffered abuse and asking their forgiveness for failing to protect them. Another resolution, which marked the 100th anniversary of women being accepted as messengers to the SBC annual meeting, affirmed the “immeasurable contribution of women” to the convention and its ministries. Another resolution called on ministers and denominational leaders to practice sexual purity and set a high moral standard of behavior. 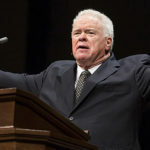 “Sexual infidelity and other violations of ministerial integrity egregiously pervert and demean the image of God and always have tragic consequences for the ministry leader, for those who are victimized, and for others impacted by the transgressions,” the resolution stated. Another resolution disavowed the “curse of Ham,” mentioned in Genesis 9, as a justification for racism. A resolution on gun violence and mass shootings specifically noted the lives lost and individuals injured when a gunman opened fire on First Baptist Church in Sutherland Springs. Arnold challenged the decision from the convention floor, but messengers supported the committee’s decision. Called for “Christlike communication,” particularly in using social media. Called Southern Baptists to pray for and support Arab Christians. Marked the 50th anniversary of Southern Baptist involvement in disaster relief and the centennial anniversaries of GuideStone Financial Resources and New Orleans Baptist Theological Seminary. Paid tribute to the life and ministry of evangelist Billy Graham. Reaffirmed Southern Baptists’ commitment to biblical inerrancy, to the exclusivity of salvation through Jesus Christ, to care for refugees, and to adopt or provide foster homes to children. Expressed appreciation to the host city, local volunteers and personnel involved in making the annual meeting possible.